Being in the chocolate trade is a sweet dream for many and an unexpected calling for the man behind candy retail chain The Cocoa Trees. Former engineer Paul Loo Lip Giam, 56, was more focused on building MRT stations and highways than tasty treats, but fate intervened. "I had not planned for all these, it happened so naturally. At every stage in your life, if you see an opportunity, you have to grab it," he says. That took him into stockbroking, where he honed his financial and risk management skills. Another move came from his wife Esther Tang-Loo, who was the head of the chocolates trading division at duty-free retailer DFS. When the new DFS chief executive decided to close the division, Mr Loo saw an opportunity to take over the distribution business for two chocolate brands from it. Mrs Tang-Loo, 54, set up Focus Network Agencies (FNA) in 1991 for the purpose - "with the blessings of DFS and a golden handshake", she says - and Mr Loo later joined the firm where he is now chief executive. FNA started distributing confectionery before moving into retail in 1993 with the FNA Chocolate Boutique, which was renamed The Cocoa Trees in 2000. The Cocoa Trees has more than 70 stores in the Asia-Pacific region, excluding Singapore. It is strong in travel retail, with 12 stores in Changi Airport alone and outlets in places such as China, India and the Maldives. 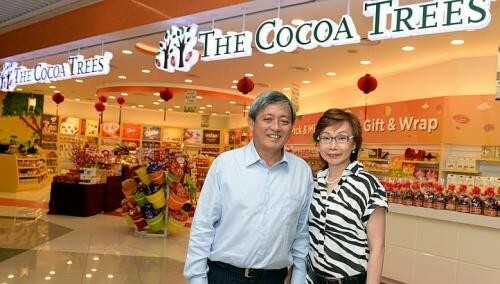 Mrs Tang-Loo, FNA executive director, says "The Cocoa Trees is truly our pride and joy". FNA employs 550 people and had revenue of more than $203 million for the 2012 financial year. Its main business is The Cocoa Trees although it also distributes chocolate to supermarkets here and overseas and is in the wine business. FNA has been recording double-digit growth for the 2013 financial year, which ends on March 31. The remarkable success of FNA and Mr Loo's ability to seize new opportunities led to him winning the Ernst & Young (EY) Entrepreneur of the Year award last year. Mr Wong Ngit Liong, chairman of the judging panel and chief executive of Venture Corporation, said in November: "In spotting the opportunity to venture into confectionery distribution... Paul epitomises the entrepreneurial qualities of being a visionary and risk taker." Mr Loo said winning the award was a milestone: "At least we get to benchmark against the industry and market. We're thankful we've arrived somewhere, and it's recognised." Winning such a coveted award does not signal that FNA or Mr Loo are resting on their laurels. He says: "In Mandarin, we say, 'chuang ye nan, shou ye geng nan' (it's tough to start a business and even tougher to keep it going). "Chasing after your competitor is easy because you can see what he's doing but if you're leading the market, you have to run very fast, and that's the challenging part." To stay ahead, he is going big on customer service with this mantra in mind - "quality in service, quality in products". He has hired a consultant to develop an intensive nine-month training programme focusing on customer service for all staff. "The important thing is to inculcate the company culture. We want to inject the FNA DNA - service, service, service." The company is also moving to a new building near the existing office in Defu Lane in June, the same month Mr Loo heads to Monte Carlo to represent Singapore at the annual EY World Entrepreneur of the Year award. He is clearly heading into a busy year but he believes the management can hold the fort while he is away. The trust goes both ways, as he wants his staff to trust him as well. As Mr Wong said of him back in November: "His strong business stewardship, coupled with a high regard for his people through good and bad times, sets Paul apart from his peers." Mr Loo says he decided to participate in the EY competition to motivate his "team, people, suppliers, partners and stakeholders". "Otherwise I wouldn't take part. When I win big, I also have a platform to thank them. "After 22 years, people work like hell... from a $1 million to a $200 million business, don't you want to thank them?" And in the firm's 22 years, no one has been retrenched or suffered a pay cut. "I don't hire and fire. No pay cuts or retrenchments," says Mr Loo, who has hired ex-convicts and former bankrupts. "They know when I push, I push very hard but when I reward, I reward handsomely. When they trust you, the work is different. "I don't manage it as a multinational company. This is what I enjoy about the business, the human side of it." When it comes to the "hardware" or business strategy, he is unfazed by chains such as Candy Empire and Candylicious, adding that "in life, you cannot stop competition". "That's why I decided on a big push in creating The Cocoa Trees legacy. It's to tell my staff we've to stay in tip-top shape all the time, and we have to understand our strengths and weaknesses," he says. The avid golfer and devout Catholic, who has four children, hopes to pass on the "legacy" of The Cocoa Trees to them so he can focus on charity. Elder daughter Pamela, 24, works as a business development manager at FNA. Elder son, Mark, 25, is a teacher's aide; third child Clare, 22, is studying management at the London School of Economics, and the youngest, Nicholas, 21, is waiting to enter university. When it comes to chocolate, Mr Loo does not have a sweet tooth - unlike his wife - but that does not stop him from loving his products. "Chocolate will never go away, it's such an important part of our lives. You can think of new recipes, gimmicks, marketing... it's never a static job."